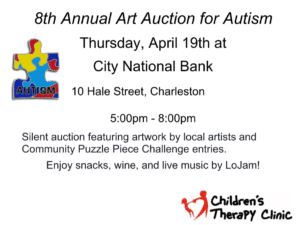 In recognition of April being Autism Awareness Month, the Children’s Therapy Clinic is having their 8th Annual “Art Auction for Autism” on Thursday, April 19th, 2018. The event will be held at City National Bank, 10 Hale Street Charleston from 5:00pm-8pm in conjunction with ArtWalk. They are asking artists to donate an original piece of artwork. The artist’s name will be prominently displayed with their artwork and will be recognized on our Facebook page. The items will be sold in a silent auction. All proceeds from the event will go towards services for children with autism at Children’s Therapy Clinic (CTC). The clinic is a non-profit organization located in Cross Lanes that provides therapy to children from low-income families and/or those with insufficient insurance coverage. CTC has been helping children of the Kanawha Valley take their first steps, speak their first words, and become more independent for over 80 years. As a local charity, we rely on the support of our community to provide both therapy (physical, occupational, speech, and music) and autism socialization services to children with special needs. For more information about the clinic, you can call Valicia Leary, Executive Director, at 304-342-9515 or visit the website www.childrenstherapyclinic.com. CTC is recognized by the IRS as a 501(c)3 non-profit organization, tax identification number is 55-0376118. We look forward to your generous donation supporting the important work we do at Children’s Therapy Clinic.